Tulips grow in a huge variety of shapes, colors and sizes. 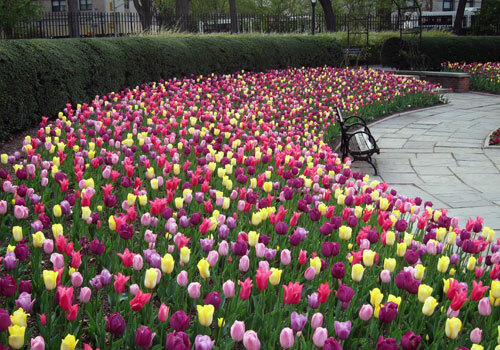 Depending on the species, tulip plants can grow anywhere from four to 28 inches tall. They originally grew in mountainous regions of the Middle East and Europe, making them well adapted to cold winters and wet springs. There are 20,000 in the North Garden of the Conservatory Garden alone. In the South Garden, you'll find up to 25 different varieties.